In mid-June 2017, rights groups reported that the U.S.-led coalition had used white phosphorus in Mosul and Raqqa as part of its campaign against Islamic State. The use of such a controversial weapon speaks to a wider and more disturbing problem. Warfare is becoming increasingly urban in nature and, like a medieval siege, exposing more and more civilians to harm. Modern sieges underscore “the difficulty, if not impossibility, of reclaiming urban terrain from entrenched rebels or insurgents without paying a high humanitarian price,” Foreign Affairs noted. White phosphorus is an incendiary weapon. Some countries, including the United States at one point n time, also consider it a chemical weapon. International law limits W.P. use in warfare to target-marking for aerial bombardment and creating smokescreens. But even these uses pose risks, as white phosphorus is difficult to control. It can blow on the wind, drifting far from its original target. It burns through flesh and bone on contact. 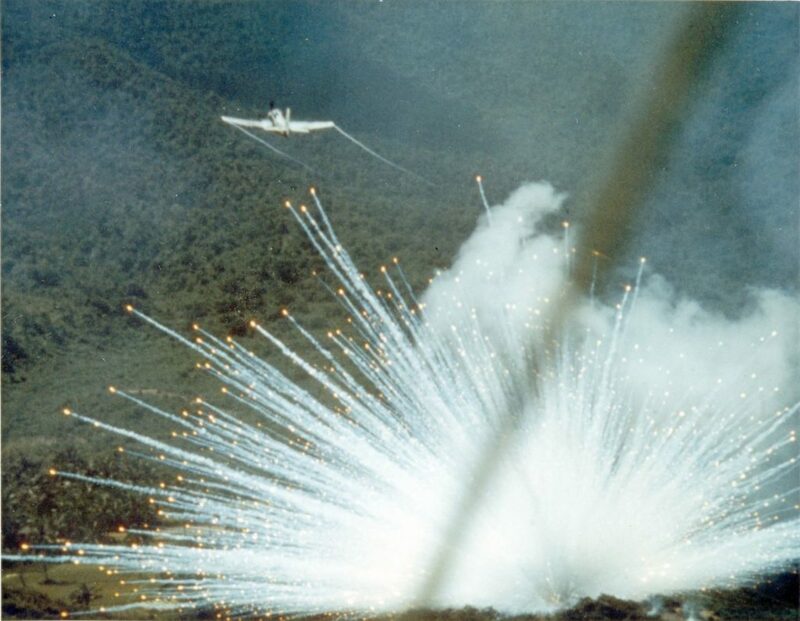 The United States has, in the past, lied about its use of white phosphorous. The Pentagon initially claimed that, during the 2004 battle for Fallujah, it deployed white phosphorous strictly in accordance with international standards. Later, the military admitted it had actually used W.P. against insurgents as an incendiary weapon. The danger W.P. poses to civilians compounds in a densely-packed urban setting. As of late June 2017, the United States and its coalition maintained that their use of phosphorous munitions in Mosul and Raqqa were in line with international law. Time will tell if those claims bear out. But white phosphorous’ resurgence points to a wider problem. Increasingly, campaigns targeting against Islamic militants takes place in cities, where even the most precise weapon can endanger innocent lives — to say nothing of imprecise weapons. In late June 2017, the Philippine government moved to end its five-week siege of the city of Marawi, which the local Maute Islamist insurgency had briefly occupied. Pres. Rodrigo Duterte defended his government’s bombardment of the city — but also apologized for civilian deaths resulting from the bombing campaign. Similar dynamics were evident elsewhere. On June 3, 2017, a truck bomb targeting the diplomatic district of Kabul killed 150 people. At least four more people died two days later when Afghan security forces fired live rounds into a crowd protesting the government’s weak response to the terror attack. A siege is meant to starve an adversary into submission by cutting off its access to supplies. But a siege is by definition indiscriminate — and inevitably impacts civilians. Of course, recent major wars featured their own devastating attacks on urban centers. In World War II, the combatants deliberately targeted each other’s cities. But World War II was an interstate war. It was part of the belligerents’ respective strategies to target civilians — in order to undermine a rival government’s legitimacy. The same cannot be said of today’s counterinsurgencies. It’s an old adage about insurgencies that if they aren’t clearly losing, they’re winning. Their very existence calls into question the legitimacy of the state. All the better if the insurgents can goad the government into harming its own people. In waging brutal urban battles, the United States and its allies — not to mention other countries fighting entrenched insurgent forces — risk alienating the very populace they rely on for support, or must govern some day. When insurgencies were largely based in remote mountain or jungle encampments, there was less risk in fighting them. Yes, some civilians were killed or displaced, but a government could maintain some semblance of authority as long as the violence occurred outside major population centers. As insurgents, militants, and terrorists increasingly operate in cities, the states that fight them risk empowering them by fighting them. It’s a circular problem with no easy solution. But the United States can make a modest start by curtailing — or better yet ending — its use of white phosphorous in Syria.